not even oriundo- calcio without citizenship: Welcome to not even an oriundo! Though the term oriundo is used both in Spanish and Italian and in different ways, many have come to understand it in the context of Italian football. From the time Raimundo Orsi, an Argentinean by birth, played for Italy in 1929 to the most recent repatriation of Thiago Motta, the oriundo 'issue' has sparked both civil and raucous debate in Italy (and even beyond) about the constitutive integrity of the nation. Those critical of claiming South American talent for Italy contend that the oriundi have tenuous links to Italy at best, and that they are taking the place of 'true' Italians. Those in support of the oriundi, or at least those not opposed to them, recognize that naturalization in the name of football exists in several countries and in varying forms. I decided to chime in by using the term in the title to emphasize my own devotion to Italy and Italian football despite being a complete outside with no Italian grandfather, or even an Italian great-grandfather. 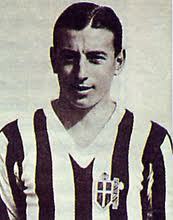 For many years, one of my indelible memories of Italian football was, in inexorable fact, a mis-remembrance. Italia'90 had many moments that could lodge themselves in a young football fan's mind. There was, for example, Roberto Baggio's fey-flight through what was then Czechoslovakia, or Salvatore Schillaci's febrile celebrations after scoring a goal. But the memory I have is of a tearful Aldo Serena sinking to his knees after missing a penalty against Argentina in the semi-final. The only problem is the man doing the sinking was Milan's Roberto Donadoni, who had missed a penalty before Serena. I had, as I recently found out, unwittingly conflated Donadoni's dejection with Serena's; or, perhaps my Rossonero disposition had led me over the years to ascribe the most defeated gesture of that bitter penalty shoot-out to Serena, who was then at Inter and who enjoyed his best years there as well. Whatever and whomever, the net effect of Italia'90 and its pains and tears was that I was an Italy fan for life. The rest is a confused history. I'm a Pakistani-Canadian who has lived in Saudi Arabia and the United States, and I currently reside in Toronto. Throughout my itinerant life, my love for Italian football has remained grounded. Despite having never lived in Italy and having less of a claim to Italian heritage than Amauri Carvalho de Oliveira, I have been a calcio stalwart for over twenty years now, enjoying, worshipping, and periodically defending from abuse the most sacred product of Il Bel Paese. In and through these pages, I hope to convey how profoundly calcio has registered on me. I will write on anything that interests me about Italian football from an impassioned perspective of someone who is not even an oriundo. Please feel free to agree or disagree vehemently about anything by commenting at the bottom of articles, or by contacting me through any of the methods listed in the 'Contact' section. although an AC Milan fan (but com'on, nobody's perfect! :-), you've got something really interesting to say about Italian football; often more interesting than our own media. above all, I like the idea of calcio without citizenship: the further from nationalism, the better. If you are born in San Marino, are you still considered Oriundo? Thanks Emanuele! I've read how the Fascists used/abused Italian football in some detail. I will check that book out. Erco: All pertinent and pressing questions :).